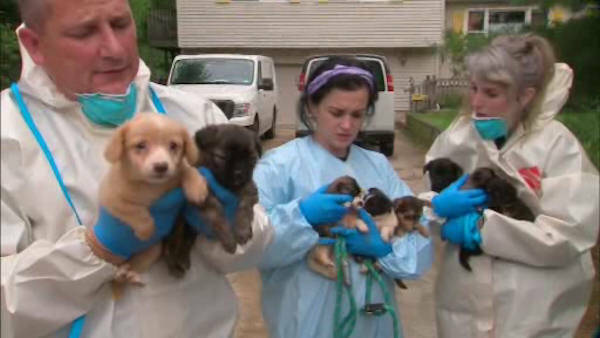 FREEHOLD, NJ (WABC) -- A New Jersey couple accused of keeping 276 dogs living in squalor inside their Howell Township home pleaded not guilty in court Wednesday. Charlene and Joseph Handrik face 752 counts of animal cruelty between Monmouth County and the Humane Society, and they said nothing after their appearance. After a call about a stray dog running around the neighborhood, local agencies responded to the scene and found the dogs living in deplorable conditions and without proper and necessary veterinary care. The dogs, some of which were pregnant and some that had to be removed from the walls, were taken to nearby animals shelters to be cared for and prepped for adoption. So far, 30 of the dogs have found homes, and all but two are in good health. The Handricks, who initially wanted some of the dogs back but were denied, may be required to pay restitution upwards of $100,000 for animal care.